Two-thirds of this area, added by the Alaska National Interest Lands Conservation Act (ANILCA) in 1981, is designated as “preserve”. But the original two million acres of Denali National Park is Congressionally-protected “Wilderness”. This huge area, which includes North America’s tallest peak, 20,310′ Denali, is completely untouched and protected from human impact. Wild animals large and small roam unfenced lands, living just as they always have. No mechanical equipment–not even bicycles–is allowed here, except on the Park Road. During winter, rangers use sled dog teams rather than snowmobiles (or “snowmachines”, as Alaskans call them) to patrol the park, just as they have since its founding. The opportunity to travel into this pristine wilderness on the Park Road is truly something special. No private vehicles are permitted beyond Mile 15, except for a few road lottery winners late in the season. So the only way to experience it first-hand (other than on foot, of course) is on a park-operated tour. 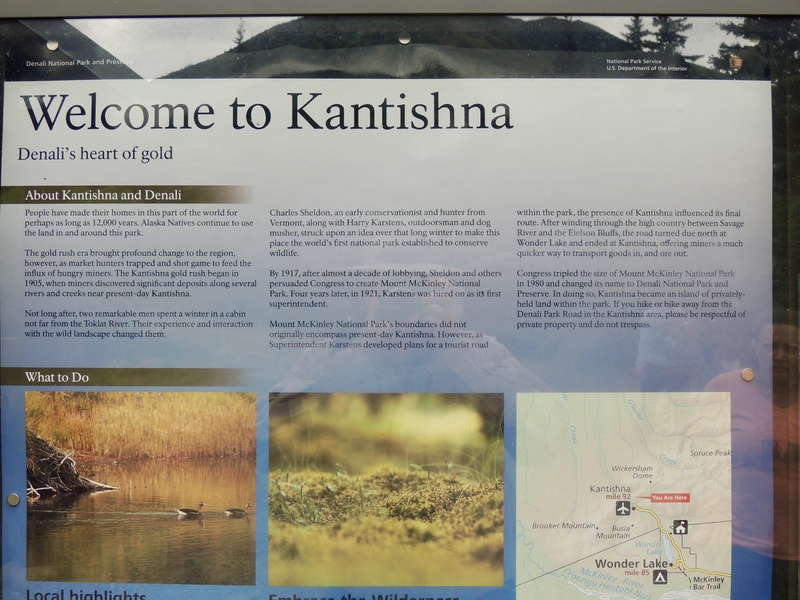 Three different tours take visitors varying distances into the park, but only the Kantishna Experience Tour goes all the way to the end of the Park Road. The park’s tour buses are similar to school buses, but they have relatively comfortable individual, fabric-covered seats and overhead storage, as well as air conditioning. Their best feature, however–just added this year–is drop-down screens on which the driver/guide can show images from a video camera with a long telephoto lens, making it easy to spot and view distant wildlife along the way. As we boarded the bus, we received a small insulated bag (ours to keep) with drinks and snacks. Later in the morning, John handed out turkey and veggie wraps for lunch. Before 7:00 am, we had reached the end of the paved road, at Savage River (Mile 15). We had a quick rest stop, then proceeded further into the park. The road became a well-improved, two-lane dirt road, but as we progressed, it became rougher and narrower, and for much of the way was only one to one and a half lanes wide as it wound through hairpin turns up and down the terrain. John had a keen eye for spotting wildlife, and stopped the bus frequently for us to view and photograph grizzly bears, Dall sheep, caribou, red foxes and a variety of birds. The animals were often somewhat distant–which made those video screens and binoculars handy–but sometimes they were right on the road, like the herd of caribou that blocked our way for a while. We also stopped about every hour at a designated rest area, where we could get out, stretch our legs, use the facilities, and take photos. We arrived at the Eileson Visitor Center, at Mile 66, just after 10:00 am. 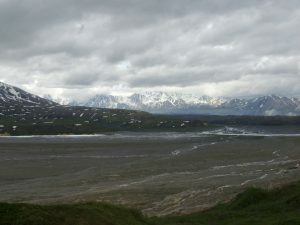 Eileson provided us with spectacular views of the Alaska Range, although Denali itself remained stubbornly shrouded in clouds. There was also a short loop hike through the tundra, and several exhibits inside the building, including an incredible two-story tall, hand-sewn silkscreen quilt depicting the Denali landscape. The Visitor Center building is tucked into a hillside to maintain a low profile, and is LEED Platinum certified for its minimal environmental impact, use of renewable energy, and sustainable building techniques. At Wonder Lake (Mile 85), Park Ranger Doris joined us. She led us on a short hike at the north end of Wonder Lake, where we learned about the history of the area and the early pioneers and environmentalists who founded the park–long before Alaska became a state–and insisted on protecting the wilderness. Finally, we made it to the end of the Park Road in Kantishna (Mile 92.5) at around 12:15 pm. We were now just as far into Denali’s wilderness as it was possible to go in a vehicle. After everyone got their obligatory photos at the End of the Road sign, Doris led us on a tour of local legend Fannie Quigley’s retirement cabin. Fannie was a hardy pioneer woman who lived with her husband, and later alone–entirely self-sufficient–in the tiny mining town of Kantishna in the 1910s-1940s. About an hour later, it was time to start our return journey. The bus dropped Doris off at Wonder Lake, and we continued back the way we came. By this point, our eyelids were becoming heavy after our early morning departure, and a quick nap was in order for many of us. But that didn’t last long, as Denali’s wildlife had saved the most dramatic sights for the end of our trip. Near Igloo Creek (Mile 34), we spotted a grizzly bear on the mountain to our left. Unlike the bears we’d seen earlier, this one wasn’t lying around or lazily feeding on plants. Instead, he was running up the hill. “What is he running from?”, John wondered. Moments later, we found out: a cow moose and her two calves were running the opposite direction, remaining in an icy creek to hide their scent. John theorized that the grizzly had tried to attack one of the calves, but mama moose quickly appeared and got in a few good kicks on the bear to defend her baby! Deciding that his meal wasn’t going to be as easy as he’d thought, the bear took off and the moose escaped. Just before this drama unfolded, another tour bus had told us that a wolf pack had just taken down a caribou in the Teklanika River at Mile 30. Sure enough, when we arrived there, we were able to see the caribou carcass–what was left of it, at least–in the riverbed. And as we watched, a wolf appeared on the bank and made his way to the kill as we watched. Discovering that it had been picked almost clean, though, he trotted off a few minutes later. At 6:30 pm, more than 12 hours after we had started, the bus dropped us off back at the Wilderness Access Center. It had been a long but incredibly exciting day. 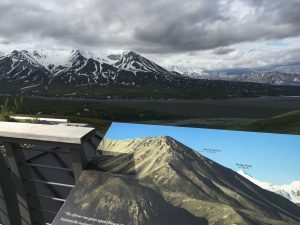 We enjoyed a pizza dinner at Prospector’s Pizza, just outside the park entrance, and then practically fell into bed once we returned home, dreaming of the amazing sights we’d been privileged to see in our Denali National Park. As of summer 2017, the price for the Kantishna Experience tour was $194 per adult and $92 per child (up to age 15). The adult ticket price includes a $10 park entry fee; however, if you have a National Parks Annual Pass, you can get this amount refunded by presenting your pass and your tour confirmation at the Wilderness Access Center. 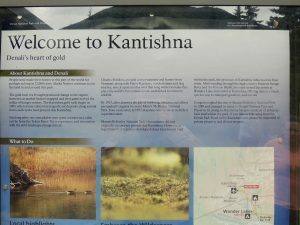 The Kantishna Experience is an all-day tour. If you want to see much of the same scenery but on a slightly shorter tour, we’d recommend the Tundra Wilderness Tour instead. It’s about four hours shorter, and although it goes only as far as the Stoney Hill Overlook at Mile 63, it’s on the same type of buses with similarly experienced driver/guides. The Tundra Wilderness Tour covers most of the spectacular views and wildlife viewing opportunities, but you’ll miss the Eileson Visitor Center, Wonder Lake, and the ranger-guided tour of Kantishna. This is also a better tour for younger children, who will likely not have the patience or endurance for the Kantishna Experience. On either of these tours, you’ll want to bring a water bottle, extra snacks, mosquito repellent, rain gear and a jacket. Wear comfortable walking shoes, and don’t forget your camera and binoculars!